Turtle Pond, Central Park, New York, USA, 06/05/2006. The American Goldfinch (Carduelis tristis), also known as the Eastern Goldfinch and Wild Canary, is a North American bird in the finch family. It is migratory, ranging from southern Canada to North Carolina during the breeding season, and from just south of the Canadian border to Mexico during the winter. Taxonomy: The American Goldfinch was one of the many species originally described by Linnaeus in the landmark 1758 10th edition of his work Systema Naturae. It was initially included in the genus Spinus, a group containing New World goldfinches and siskins, but in 1976, Spinus was merged into the genus Carduelis as a subgenus. 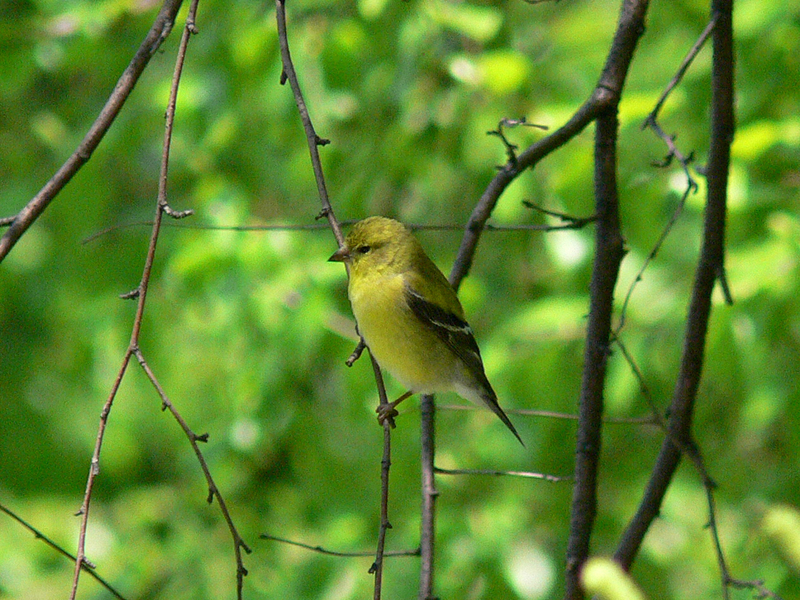 Its closest relatives are the Lesser Goldfinch (C. psaltria), Lawrence’s Goldfinch (C. lawrencei), and the siskins. Although it shares a name with the European Goldfinch, the two are in separate subgenera and are not directly related. Carduelis is derived from carduus, the Latin word for thistle; the species name tristis is Latin for ‘sorrowful’. There are four recognised subspecies of the American Goldfinch. Description: The American Goldfinch is a small finch, 11–14 centimeters (4.3–5.5 in) long, with a wingspan of 19–22 centimeters (7.5–8.7 in). It weighs between 11–20 grams (0.39–0.71 oz). Among standard measurements, the wing chord is 6.5 to 7.8 cm (2.6 to 3.1 in), the tail is 4.2 to 5.1 cm (1.7 to 2.0 in), the culmen is 0.9 to 1.1 cm (0.35 to 0.43 in) and the tarsus is 1.2 to 1.4 cm (0.47 to 0.55 in). The beak is small, conical, and pink for most of the year, but turns bright orange with the spring molt in both sexes. The shape and size of the beak aid in the extraction of seeds from the seed heads of thistles, sunflowers, and other plants. The American Goldfinch undergoes a molt in the spring and autumn. It is the only cardueline finch to undergo a molt twice a year. During the winter molt it sheds all its feathers; in the spring, it sheds all but the wing and tail feathers, which are dark brown in the female and black in the male. The markings on these feathers remain through each molt, with bars on the wings and white under and at the edges of the short, notched tail. The sexual dimorphism displayed in plumage coloration is especially pronounced after the spring molt, when the bright color of the male’s summer plumage is needed to attract a mate. Distribution and habitat: The American Goldfinch prefers open country where weeds thrive, such as fields, meadows, flood plains, as well as roadsides, orchards, and gardens. It may also be found in open deciduous and riparian woodlands and areas of secondary growth. This habitat preference continues during the spring and autumn migrations.